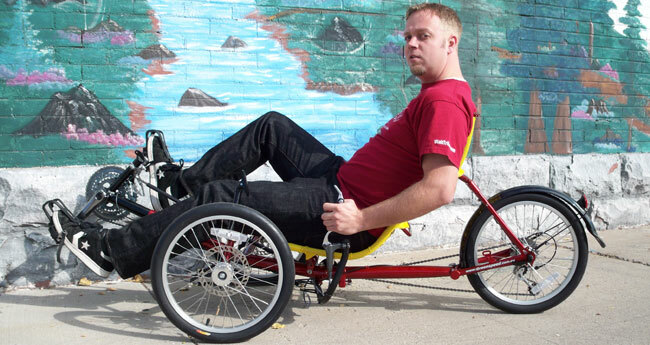 It's been a common misconception of mine to believe that having smaller wheels on a recumbent trike means you'd have a less comfortable ride. As if being closer to the ground and having less frame and wheel mass between you and the pavement would make you feel every bump in the road. The Greenspeed trike proves that theory wrong. My first ride on the Greenspeed GT5 was as comfortable as any 20" wheeled touring bike I had ridden, even though the GT5 has all around 16" wheels. The seat, with it's built in lumbar support, contoured my back comfortably, and the mesh seat added to that comfort. I thought the trike would be heavy, because I had always believed that any folding Trike would be 10 pounds heavier than a non-folding trike of a similar class. But the GT5 still felt light, weighing in at only 37.5 pounds. And folding the GT5 is a breeze. Everything is quick release, meaning that when you're on the go, transporting your trike won't slow you down. The GT5 has smooth linkage steering and has a good turning circle of 12 feet. It comes stock with a rear fender, safety flag and one mirror. On the Greenspeed, the mirror attaches to a post that is separate from the steering bar. I personally prefer this location for a rearview mirror because even when you're steering, the mirror won't move and you won't loose sight of what's behind you. The angle of the ergonomic mesh seat on the GT5 is set at 40 degrees. This is a good angle for casual riding and long distance touring. The GT5 is available in metallic red or blue, but always with a bright yellow seat. While I wish there were more choices for different colors, the stock colors are extremely visible. Especially when comparing their bright yellow mesh seat to the standard black mesh seat often found on other recumbent trike models. The mesh seat is tied together in the back with an elastic type of cord. I�m not sure the best way to tighten the seat in the back or even if you�d ever need to, but it�s worth noting. 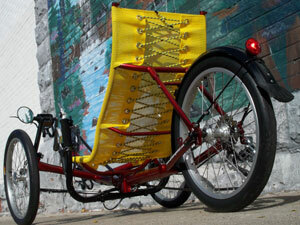 The tires on the Greenspeed GT5 folding trike are the "Greenspeed Scorcher". They seem to be similar to the Schwalbe Stelvio or Kojack racing tire. Very smooth and fast. At 100 psi they seemed to glide down the road at a good pace. With a little less air pressure, they were a bit smoother on the bumps, but still held their feel for speed. From what I could tell, there didn't seem to be any Kevlar in the tires, but the high PSI actually does help protect against punctures. The rims and tubes that come stock with the GT5 are fitted for Schraeder valves. While this valve style is not my favorite, it is certainly more common on non-human powered vehicles and the average bike, and I could see that valve choice coming in handy in a person's day to day travels. The GT5 is a 27-speed, with a Shimano 105 front a rear derailleur and a Shimano Dura-Ace 9 speed shifter and a Shimano Capreo 9-26 9 speed cassette in the back. The brakes on this trike are Disc Gator Brakes and worked great when wanting to stop quickly. The Greenspeed GT5 has a total weight capacity of 265 pounds and can fit a rider X-Seam range of 41-49" on the Standard boom and 37-45" on the Small boom. I think the Greenspeed GT5 is the perfect buy for someone who likes to take their trike with them when they travel. The components are high end so you won�t have to worry about major equipment failures as you�re out traveling. Because, if you�ve just flown to Beijing to trike around the place, you may not be able to find a local bike store with the correct replacement rear derailleur in stock. So having a trike that�s stocked with high end quality parts will mean you�ll have more time riding your trike and less time fixing it. It�s quick and easy to fold and unfold, which is important when you�re trying to catch a bus or train. 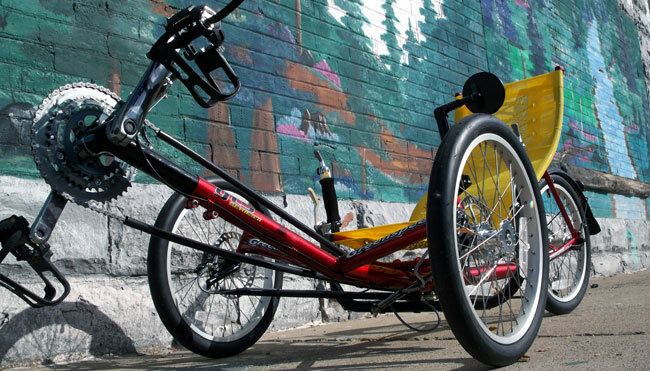 If you�re an all-around explorer, this trike is an excellent choice.